Kalamera 15'' Wine Refrigerator 30 Bottle Built-in Single Zone (March 2019) Review! Kalamera is a fairly new brand and not a lot of people have heard about it. But, despite being a new brand it is winning over customers’ heart by providing quality products and amazing after sale services. Kalamera KRC-30SZB is a 15″ wide wine refrigerator. You can store up to 30 bottles into it a time and it’s a single zone cooler. You can easily set the temperature using the one touch controller, it allows you to set from 40 degrees Fahrenheit to 66 degrees Fahrenheit. It maintains the temperature perfectly and your wine stays chilled all the time. You can use it as a built-in unit since it doesn’t use much space. You can also use it as a counter top if you like. The design of the product is so good that it will match with any background setting you might have. The gray handle and glass door looks so good that makes the whole unit look really sophisticated. There are six shelves made of beach would which are removable and movable if required. The top and bottom shelf is bigger than other shelf which you can use to store bigger bottles. This is pretty good feature which comes in very handy and it is not common in other units of same range. The average rating on this product is 4.3 out of 5 and there are hundreds of satisfied customers. The main reason is quality of product. We definitely recommend you to check out detailed customer reviews here if you’re interested in this product. We’ve compiled a list of top 10 wine refrigerators reviews on our site that we definitely recommend that you check before making a final decision. If you’re looking for low-budget single zone wine cooler then Haier 6-Bottle Wine Cellar with Electronic Controls Review is a real good option. 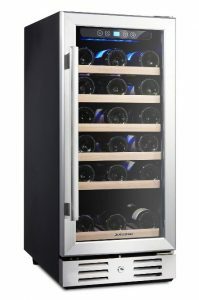 You can also go for dual zone wine cooler if you prefer to store different types of wines together. This right here is a good dual zone cooler you can look at – Koldfront 24 Bottle Free Standing Dual Zone Wine Cooler Review.